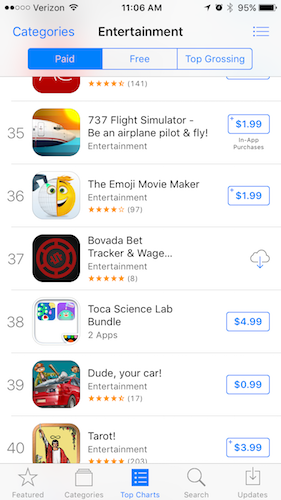 Yesterday, Sports Bet Tracker & Wager Analysis was listed #115 under top "Paid" apps in the "Entertainment" category. Today it jumped to #42, and cracked the top 200 of most grossing, at #199! Incredible. I'd like to lay out the reasons why it has spiked in the last month. In the last 30 days, it has made nearly as much as since its launch almost a year ago (September 22, 2016). Football season: The biggest sport in America (by a lot), is just getting started. College, which started last week, and the NFL, which starts today). Promotion: I think it also helps that I have a sale through today, of 45% off the regular price. People love to know they're getting a deal. I will probably keep some sort of promotion going for each football weekend, and the start of NBA and NHL seasons. App Update: I decided to launch a very minor update back on August 22. The app hadn't seen an update since April. People like to see that the app has been updated recently and that they will likely see updates, fixes, and improvements for their pay-to-download app. Reviews: I put this last, but it's one of the most important things. Today, since that August 22 update, I have 7 random 5-star reviews in the last two weeks. I have 17 reviews total. Yes, downloads have nearly doubled in that span, but the thing is, all of those reviews have no comment/text. What does this mean? Most likely, they used the newly added (in most recent update) SKStoreReviewController. It makes it so much easier to give a star rating. Now that it has eclipsed 5 stars, users now see the rating in the App Store feed. This, I believe, is crucial to get clicks into your app detail page, and more downloads, as users inherently trust other users. Too bad it will only be useful for 1-2 weeks, as iOS11 and the new app store won't reset reviews after an update. In a seasonal market, make sure you hit your deadlines. Always keep a keen eye on your "front lawn". Upkeep like your house is on the market (it is). I plan on releasing a decent/major redesign refresh in conjunction with iOS11. It's pretty much already done and will go into beta this week. I've had numerous people volunteer to be part of the beta, which is in itself exciting. I'll make a post about that later this week. Edit 9/18/2017. Held consistently on second football weekend in the top 50 paid, top 200 grossing. Side note: Looking back, I maybe should have made the primary category "Sports" (I still could change it), as what is the sports bettor most likely to browse? A mish mash of entertainment titles or things they are actually geared towards. In fact, I think I convinced myself to switch it with the next update. © 2015 - 2017 Arbor Apps LLC.